You Can't Afford to Miss this Super Sale! Who’s ready to FALL in love? No, it’s not Valentine’s Day, but if you’re anything like me, you LOVE saving big, especially at Macy’s…which is exactly what you can do right now during Macy’s Fall Sale! How to Save: Place qualifying items in shopping bag, then enter promo code FALL in the box labeled “HAVE A PROMO CODE?” and click “APPLY.” You can enter the promo code in your shopping bag at any time before or during checkout. * EXTRA 20% OFF: select reg. & sale in store and select reg., sale & clearance online: clothing & accessories for him, her & kids. * EXTRA 15% OFF: select reg. & sale in store and select reg., sale & clearance online: shoes, coats, suits, dresses, lingerie, swim for her, suit separates & sport coats for him, fine and fashion jewelry, home items & kitchen electrics. 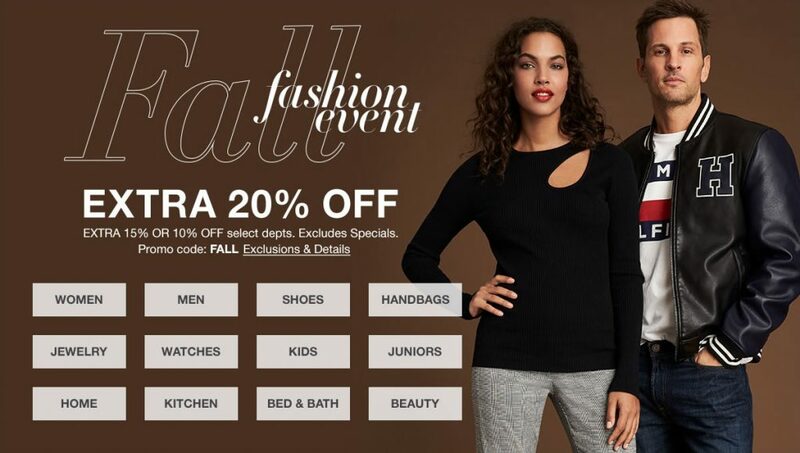 Keep in mind, there are exclusions and the Fall Sale promo code cannot be combined with any savings pass/coupon, extra discount or credit offer except opening a new Macy’s account. read these 7 Ways to Save Money at Macy’s now!